Speak Up for Libraries Conference 2017 – Booking now open! 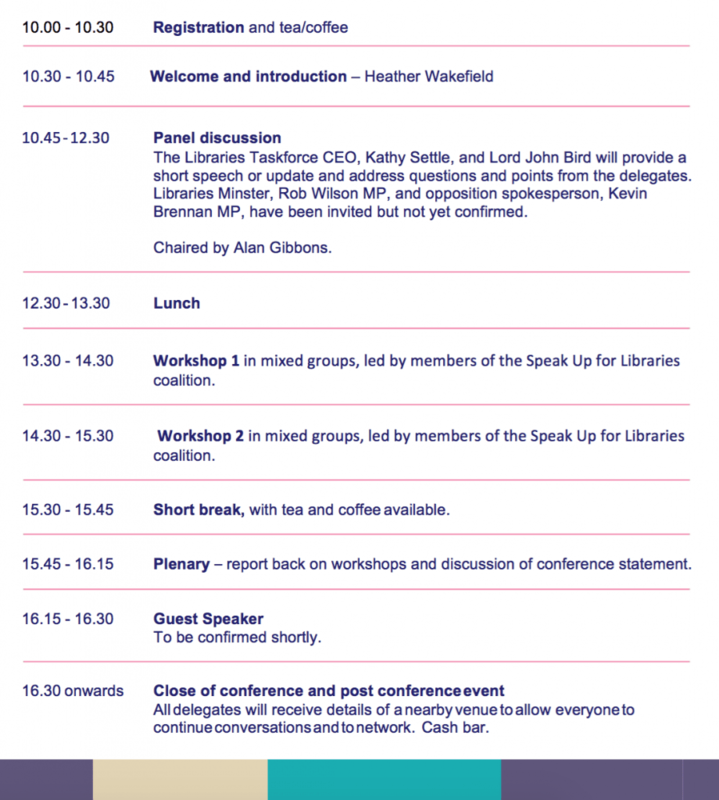 On 18 February 2017 Speak Up for Libraries will be holding this year’s national conference on public libraries. It will bring together library campaigners, union members, library users and library workers. Please download and share copies for those not online, to help spread the word. Book your place online on our Eventbrite page. Places are limited so don’t delay booking. We are offering an Early Bird booking rate of only £20 per person for those who book a place by 18 January 2017. If places remain after this date they will be at the full price of £25 per person. All bookings include refreshments and lunch. Please note, if you are booking for someone else, please ensure you know of any special requirements they may have as well as their preference for workshops as this information will be required. You will also be asked to indicate if the person you are booking for wishes for a group/campaign or organisation to be listed alongside their name, and/or their email address, on the delegate list for the event.